Shravan Maas is a holy month in the Hindu calendar and is considered as the month of fasting. During this period, Hindu devotees show their dedication towards Lord Shiva and Goddess Parvati by fasting every Monday and Tuesday. It is also the period when several Hindu festivals are celebrated with great zeal and zest; therefore, it is one of the highly revered months in a Hindu year. In 2018, Shravan Maas began on 23rd July and is ending on 22nd August. Raksha Bandhan in North India, Shravani Mela in Jharkhand, Pavitropana in Gujarat and Gamha Purnima in Odisha are certain prominent festivals which are celebrated during this holy month. Lord Shiva is the most worshipped Hindu deity during this season and people all over the world throng to Shiva temples to provide their god with offerings and get blessings in return. So, before this vibrant season ends, visit the following Shiva temples in Delhi and purify your soul amidst their devotional aura. Read on to know more about these highly revered religious sites. Undoubtedly, one of the most popular Shiva temples in Delhi, Gauri Shankar Temple is located on Chandni Chowk Road in the vicinity of Red Fort and is believed to have been established by a soldier who returned to his home safely from a war. The temple complex was constructed a few decades ago and since then, it has been one of the most visited Shiva temples in Delhi. The Shivalinga kept inside the temple is said to be 800 years old. Therefore, Hindu devotees come in hundreds every day to worship their god and take home his blessings. If you are looking forward to celebrating this Shravan Maas with exuberance and elation, then Gauri Shankar Temple is a perfect place for you. Did you know that Chhatarpur Temple, established in the year 1974, was once the largest temple in India? Yes, this vast complex of Hindu temples was considered as the largest temple in India until the great Akshardham Temple was built and came into prominence. However, it is still one of the most visited Hindu temples in the country and is believed to be frequented by thousands of devotees every year. The temple complex houses shrines dedicated to all the major Hindu gods and goddess. Therefore, you can also find a building dedicated to Lord Shiva within its boundaries. The temple is located at a distance of about 4 km from Qutub Minar and is an ideal place to get lost in a peaceful environment filled with a positive ambience. So, do not miss out on this heavenly beauty this Shravan Maas. Located in the close proximity of Delhi Gate, Shri Shiv Mandir is a small temple complex which is known for its large Shiva statue established on the roof of the temple. With the presence of sacred peepal trees, the surroundings of Shri Shiv Mandir maintain a balanced atmosphere where you can certainly feel the essence of serenity and divinity. Even though the temple is very small is size, it witnesses Hindu devotees in thousands every year. The sanctum of the temple is dedicated to Lord Bhairava, the fierce form of Lord Shiva, who is offered alcohol by the visitors as a part of the rituals. 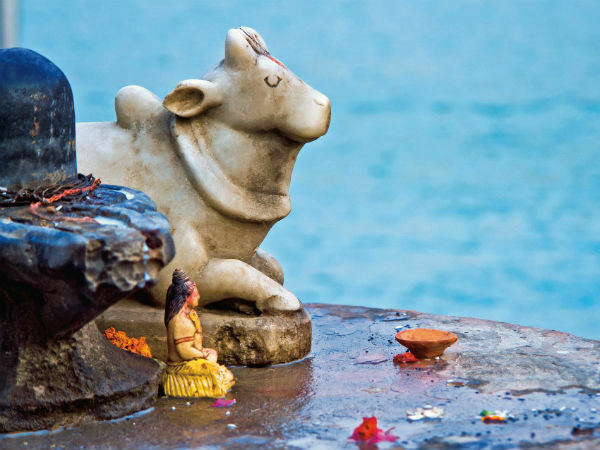 Wouldn't you love to celebrate your Shravan Maas at this unusual temple? Situated at the back of Red Fort in the vicinity of Nigambodh Ghat, Neeli Chhatri is probably one of the oldest temples in India. As per legends, the temple is said to have been established by Yudhishthira, the eldest of the Pandavas, during the era of the epic Mahabharata. Since then, the temple has been a major religious site and is visited by thousands of devotees and tourists every year. As the temple is dedicated to Lord Shiva, it is a perfect place to celebrate this Shravan Shivratri. Do you know the temple is also the site where Yudhishthira performed the great Ashvamedha Yagya? So, you should not miss visiting this age-old temple and exploring its beauty. How can this 5000-year-old temple lag behind when the talk is about Shiva temples in Delhi? Even though the temple is located in Ghaziabad of Uttar Pradesh at a distance of about 40 km from Red Fort, it is counted as one amongst the Shiva temples in Delhi on account of the presence of Ghaziabad in the National Capital Region of Delhi. The temple is said to have been established 5000 years ago and since then, devotees have been offering milk to their lord. The temple site is also the place where Lord Shiva appeared for the first and the last time in Kalyuga. So, what do you think about planning a visit to this incredible temple during Shravan Maas? Another temple where you can find yourself amidst a devotional atmosphere is Mangal Mahadev Birla Kanan. The temple was established in the year 1994 and is located near Shivaji Marg. During the Shravan Maas, it is one of the most frequented Shiva temples in Delhi. Therefore, you must visit this beautiful site where you can assuredly find peace.